Everyone familiar with “A Bad Lip Reading”? Yeah, they do pretty good work. 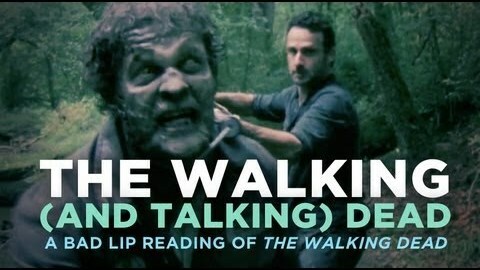 And this montage of Walking Dead scenes, dubbed awesomely bad, is golden! I swear that sometimes these people seem like the most talented video spoofers on the internet today. Oh, and be sure to stick with it right until the end. No spoilers, but the “La-Bibbida-Bibba-Dum” song alone is worth the price of admission! Uhm… what just happened? Funny! A hilarious musical interlude? A-bibbida-bidda-dum!